I enjoyed creating just for my little ones so much last week, that I spent another afternoon sewing for Miss nearly 3. Although I will admit that what I created were 'testing' items for my new autumn/winter range! I saw this on Pinterest last week. Miss nearly 3 loves pockets but prefers to wear skirts and dresses and mostly they don’t have pockets. So when I saw this I just knew she needed one! I followed the tutorial but will adapt a few more things next time. I like to do things my way! So I’m thinking of making these with denim and cord for autumn/winter, with the trim and pockets as the splash of colour. What do you think? 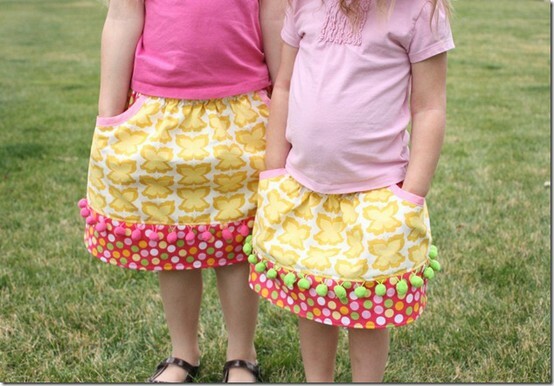 I did them without the pompom trim as I do include them in my other skirts and I just don’t think it needed them.